Apple is reportedly narrowing in on a way of serving up its slate of high-budget TV shows, the plan being to pair its original content with subscriptions from outside companies. An Apple service will be highlighted in the "TV" app pre-installed on iPhones, iPads, and the Apple TV, sources told CNBC. People who own one of those devices will be able to watch Apple-owned shows for free, but the company is allegedly planning to offer access to subscription "channels" for outside online services. 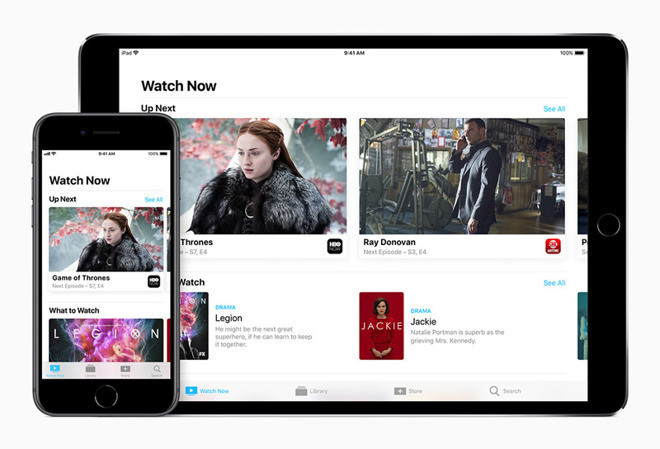 As a part of the effort, Apple is expected to launch an overhauled version of the TV app early next year. Further on, Apple is hoping to score "tent pole" shows that could prop up its own paid service akin to Netflix, the sources added. These would however follow the company's philosophy of aiming for family-friendly content, meaning it won't have an equivalent of "Game of Thrones," "Mindhunter," or other draws to services like HBO and Netflix. Apple has tasked Time Warner Cable's former chief strategy officer, Peter Stern, with forging the contracts it needs to assemble a service. Stern is also said to be in charge of attracting publications to Texture, the magazine subscription service it picked up earlier in 2018, but dealing with resistance to giving Apple control of the subscribing billing relationship, since they would rather have their own ways of deterring cancellations. Rumors that Apple's TV shows would be free perks in the "TV" app have been around for some time, but until now it wasn't clear how the company might make money on the prospect. Apple is believed to be spending at least $1 billion on its first wave.